If you’re shopping for a 2016 model vehicle this holiday season, Kelley Blue Book has a dozen suggestions, winners of its annual Best Buy Awards. Honda was the big winner with its redesigned Civic not only winning KBB’s small car category – one of four Honda category winners – but taking home the overall crown as well. 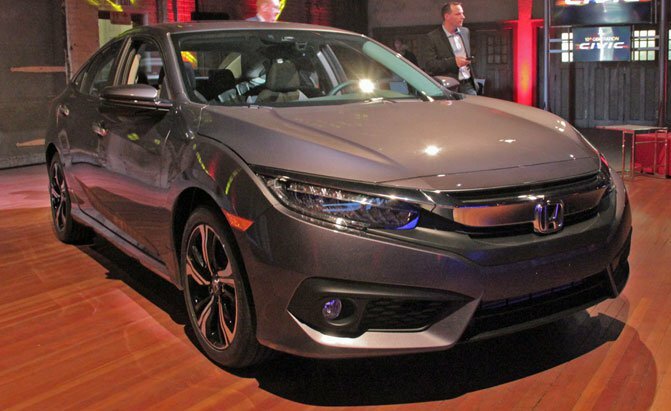 Honda Civic leads “elite group” of 2016 models, says Kelley Blue Book. Chevrolet also won four of 12 major vehicle categories, while Kia, Ford, Lexus and Mercedes-Benz each scored victories in a single category. Altogether, KBB experts tested and evaluated 49 finalists for the 2016 Best Buy Awards from among more than 300 new-car models. Which obviously means you could expand your view beyond the winners to 37 other highly rated vehicles – at least according to Kelley Blue Book. “After carefully analyzing a wealth of data and conducting extensive vehicle testing and evaluation from the hundreds of models available for the 2016 model year, we chose this year’s elite group … because they proved to be the top values in their class,” said Jack R. Nerad of Kelley Blue Book. Besides the Civic, Honda vehicles and the categories they won are: CR-V, small SUV/crossover, the best-selling SUV in the country; redesigned Pilot, mid-size SUV/crossover, and Odyssey, minivan. Chevrolet winners were the Impala, full-size car; Corvette, sports/performance car; the redesigned Volt, electric/hybrid, and Tahoe, full-size SUV/crossover, the best-selling vehicle in the segment. Other Best Buy category winners were the redesigned Kia Optima, mid-size car; Ford F-150, pickup; Lexus RX, luxury SUV/crossover, and Mercedes-Benz C-Class, luxury car. A complete list of nominees by major vehicle category is available online at KBB.com. “The awards are the culmination of a year-long regimen of expert vehicle evaluation and testing of nearly every new vehicle available in America, along with analysis of a broad swath of vehicle-related data, including vehicle pricing/transaction prices, five-year cost-to-own data, consumer reviews and ratings, and vehicle sales/retail sales information,” said a KBB press release. Cost-to-own includes depreciation, insurance, maintenance, financing, fuel, fees and taxes for new cars. “The awards program is designed to provide a significant service to American new-car buyers by identifying the cream of the crop of all available 2016 model-year vehicles,” according to KBB.